While renovating the building for the Cactus shop, Elias made several interesting discoveries. First, a group of horizontal pipes were discovered in the wall. These have now been identified as being the same type of clay pipes found in other Roman Era bath houses such as the ones in Pompeii and Cyprus. These pipes were in the wall, with small stones surrounding them. One visitor has identified these as the same as other Roman bath houses. The pipes had two outlets on the front wall, each that had a fan below the vents, which have been identified as possibly being from Babylonian times. Further another vent was discovered on the side wall, with a palm tree, which was a common Greek symbol. The palm tree is sitting on a half round that contains a very small fan symbol. Another interesting discovery was an archway at the back of an unused room. Wondering where this led, Elias started to excavate, and found a tunnel, that led to what ultimately was identified as the oven for the bath house. They also found a group of archways below the floor which made up an amazing hypocaust of the bath house, and a tub. 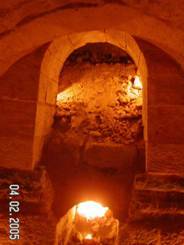 Having discovered these, the Israeli Antiquity Authority came out in 1993, and proclaimed, at the time, that these were the remnants of a Turkish Hammam, built in 1885 and not considered of historical value, and thus Elias was free to excavate as he pleased. Even only believing that it was a Hammam and not something more ancient, Elias carefully started to excavate the site. Many of the locals thought Elias was crazy to be digging the site, and said he should bulldoze it. Something in Elias kept him working despite the criticism. What Elias didn’t know at the time, was that he was discovering something that belongs to the heritage of the world. At the same time, Elias and Martina were also renovating and remodeling the store, which they would discover was part of the calderium (hot room) of the bath house. 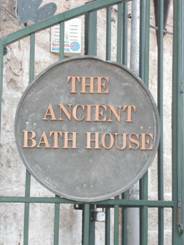 It was not until a customer came and said that the site looked nearly identical to the Roman Bath in Bath England, where she lived, that Elias and Martina realized that they had not discovered a Hammam, but something much older. After this point, they started to do a great deal of research to find evidence about the history of the site. From this point, news of the site spread through several major outlets, including National Public Radio (NPR) in the United States, the Guardian in the United Kingdom, the Associate Press, as well as through smaller news outlets. Many archaeologists and other experts have now visited the site, and some have done more extensive research and testing. The Discovery Channel has filmed at the location to include the site in the upcoming documentary The Real Life of Jesus. And while there has been a fair amount of attention that has been given to the site, there is still a lot of work to be done, and money to be raised for the site to have a full excavation, and potentially a full renovation. All of which will uncover more of the history of this site, and shed more light on the history of Nazareth, and how it relates to Jesus Christ. Please consider helping us to achieve this dream.